← Is Fiber Bend Radius Really a Concern? 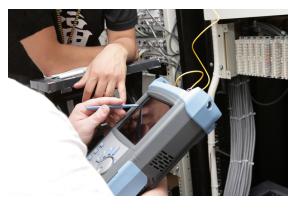 OTDR (Optical Time Domain Reflectometer), as an important test instrument, is widely used in OSP (Outside Plant) and premises cabling networks to characterize an optical fiber. Dynamic range and dead zone are two main specifications of an OTDR. So, is there any relationship between them? And what do they mean to OTDR performance? The dead zone of an OTDR is the distance (or time) where the OTDR cannot detect or precisely localize any event or artifact on the fiber link. When a strong reflection occurs, the power received by the detector is saturable. It requires time to recover from its saturated condition. During this time, it will not detect the backscattered signal accurately. We call the length of fiber that is not fully characterized during this period as dead zone. 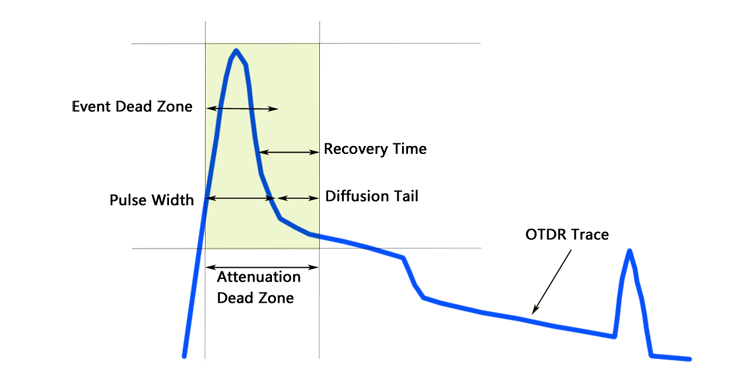 In general, dead zone on the OTDR trace can be divided into event dead zone (EDZ) and the attenuation dead zone (ADZ). In this case, short dead zones are much more important than dynamic range since the distances are short enough that you do not need a great deal of dynamic range. However, in order to detect patch cords and measure the loss at each end of a short fiber link, short dead zones are required. Here, the long-haul applications refers to the distance that is greater than 20 km. In this case, loss of the fiber itself creates a significant amount of loss, thus dynamic range is an important specification for these long fiber links. Additionally, distance range is also important for long links. However, OTDR suppliers do not always specify dynamic range in a meaningful way. Dynamic range and dead zones are both important specification of OTDRs and they have a directly proportional relationship. As dynamic range increases, the deadzone increases. To balance the relationship between the dynamic range and dead zones should depend on the application enviroment. In addition, due to the specification difference between different OTDR manufactures, it is important to read and understand the fine print in the specification sheets before buying. This entry was posted in Fiber Optic Testers, Fiber Testers & Tools and tagged Dead Zones, Dynamic range, OTDR. Bookmark the permalink.